NASA's planet-hunting Kepler spacecraft should be able to achieve its primary mission goal regardless of whether or not it can bounce back from a recent malfunction, researchers say. Kepler launched in March 2009 on a 3.5-year prime mission to determine how common Earth-like planets are throughout the Milky Way galaxy. That goal is likely already attainable, even if the spacecraft is unable to recover from the glitch that halted its exoplanet hunt two months ago, mission team members say. "Now, we won't have as tight error bars as we would otherwise have, and we won't have orbital periods out well beyond Earth's in terms of Earth-size planets," Jenkins said during a lecture last month at the SETI Institute. "But we'll still do a credible job and a good enough job delivering the answers that we need." Kepler spots exoplanets by noting the tiny brightness dips caused when they cross the face of their parent stars. The observatory needs to see three of these "transits" to flag an alien world, so it takes years to detect planets orbiting relatively far from their stars. This is precision work, and the Kepler space telescope requires three functioning gyroscope-like reaction wheels to stay locked onto its 150,000-plus target stars. The observatory launched in 2009 with four reaction wheels — three for immediate use, and one spare. One wheel, known as number two, failed in July 2012. Another (number four) stopped working on May 11 of this year, robbing Kepler of its precision pointing ability. Kepler hasn't searched for exoplanets since the latter wheel failure. Mission engineers have been devising possible fixes for the problem, and they plan to start sending some of these commands to the spacecraft over the next week or two. If at least one of the failed wheels cannot be brought back, Kepler will almost certainly be given a new mission, researchers say — one that emphasizes scanning instead of its previous point-and-stare operations. While the Kepler team would love to continue the exoplanet hunt for years to come, researchers can likely determine the Milky Way's frequency of Earth-like worlds with the data the spacecraft has already collected, Jenkins said. But doing so will require a fair bit of work. Scientists also need to determine the completeness and reliability of Kepler's discovery system, among other things, and understand how the mission's target stars relate to the stellar population of the Milky Way as a whole to enable extrapolation, Jenkins added. The target stars "were chosen to be really good for discovering transiting planets but undoubtedly have selection biases in them," he said. All of this work should keep mission scientists busy for some time to come. "We have about two years of data that we have yet to fully search; we're still in the process of searching through the third year of data," Jenkins said. "I think that this could occupy us for another two to three years, easily." 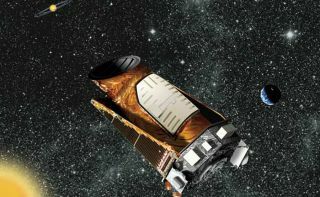 The Kepler mission's total pricetag is about $600 million thus far, and it costs about $20 million per year to operate the spacecraft and analyze the data, NASA officials have said.